“You don’t spit?” Dan asked incredulously. 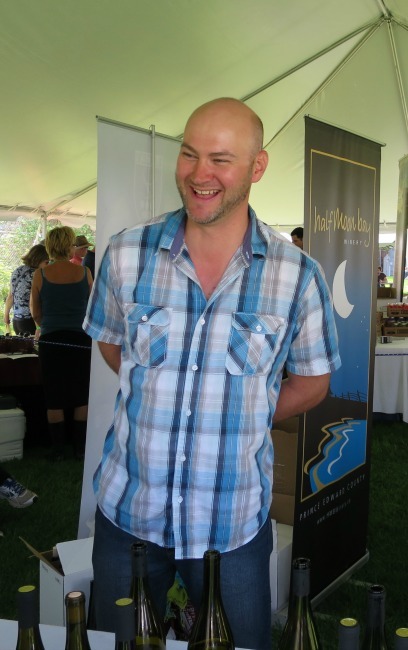 Dan Tweyman is the nearly new winemaker at Trail Winery. 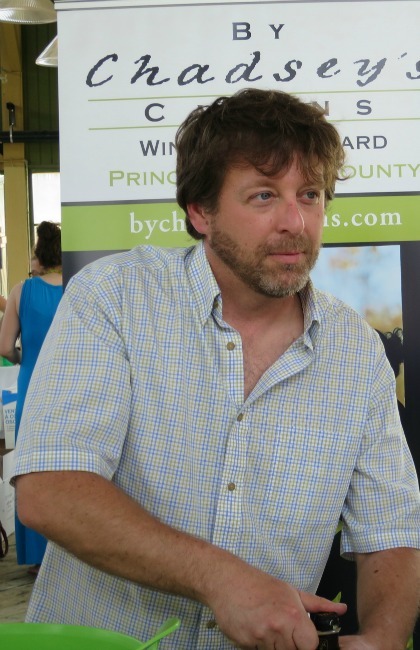 I met him Saturday at Terroir 2015 in Picton. Prince Edward County. He is one of four new winemakers that I met at Terroir. It was a marvelous day: 21 wineries, 35 other vendors with foods, pickles, preserves, cheeses and chocolate. The sun was shining, it was over 30 ºC and packed with people happily buying wine and goodies. Terroir is the start of wine seasons. Well actually no, I don’t spit. I’m a wine tourist not a connoisseur and I have no idea how one goes about spitting out 42 splashes of wine. First of all, I was brought up by a mother who firmly drilled it into me that ladies don’t spit. Secondly, half the tables at Terroir didn’t even have a container to pour out excess wine. I did pour out every thing but the first taste wherever possible and I did ask just for a tiny splash not the regular 2 oz tasting. How do you spit out wine inconspicuously at a crowded function like Terroir? I can’t spit directly into their little surplus wine receptacle – that would be gross! Unfortunately, my capacity for wine does not exceed two glasses at one sitting, so Terroir is hard on my system and my husband usually has to guide me off the grounds before I pull a Rob Ford drunken stupor scene. After 42 splashes of wine there are only two kinds of wine – red and not red – and they all taste the same. Some have snazzier labels. After 42 splashes of wine you cannot remember where you tasted that glass of something-or-other that you really liked when you first arrived but didn’t want to haul bottles around all afternoon. The fact that I remember Dan’s name is a minor miracle. 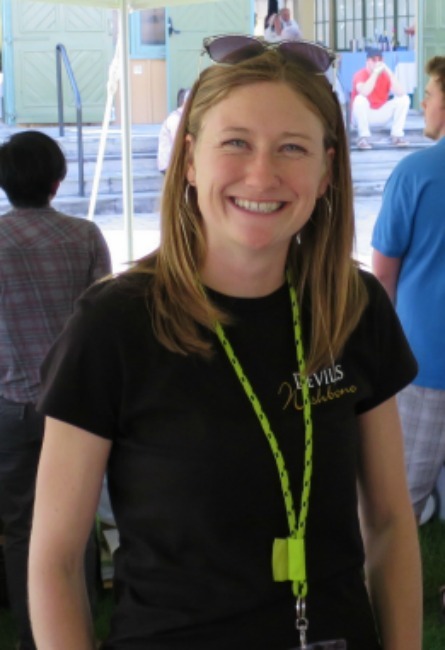 I do distinctly remember stopping by the booth of my friend Liz Lacey of Lacey Estates Winery and trying their Gewurz which was blissfully good even though it was splash #37. Then being told I couldn’t buy a bottle because their table has a mix of VQA and non VQA wines and so they were not even allowed to sell their VQA approved Gewurz because it might have been contaminated by the proximity of those low-life non-VQA bottles next to them. I came very close to a Rob Ford rant. Meeting the new and nearly new winemakers at Trail, Traynor, By Chadsey’s Cairns and Devils Wishbone. Catching up with Winery owners, Colin Stanner, Sherri Karlo, Lynn Sullivan of Rosehall Run, Heidi Del-Gatto, Liz Lacey, Micheline Kuepfer of Broken Stone and Paul Marconi.of Casa Dea. Tasting the new releases from Norm Hardie, Huff Estates, Half Moon Bay, Sugarbush ,and Sandbanks and trying the pairings of Lighthall wine and cheese with owner /winemaker/cheese maker Glen Symons. Nearby, I had a chance to talk with Patricia Bertozi of Fifth Town Cheese. Sadly, The Grange didn’t make it so I settled for the next best thing, a chocolate cupcake infused with their Pinot Noir by Iced CupCakery. By that time, I’d forgotten that I was supposed to be gluten free. After 42 splashes of wine, the fact that there are five wineries I hadn’t visited yet was totally irrelevant. It was time to go home. All photographs supplied by Colin Leonard who Thank God is also always my Designated Driver. It took me a long time to get used to the idea of spitting and I still find it hard to do at large events where no one else seems to be doing that. I usually do the sip and pour at those, though it inhibits how much I can taste. At the Wine Bloggers Conference, I learned to bring a small, plastic cup of my own so I always had a spittoon and could be discreet. It suited me more than the communal bucket. I do think it helps with your tasting abilities and I actually enjoy events more when spitting is the norm. Thank you Krista for your advice. Natalie MacLean also directed me to a blog she wrote on the subject How to Spit wine without losing your dignity. https://www.nataliemaclean.com/blog/spit-wine-expectorate-spittoon/ which includes a hysterical account of missing the spittoon and spraying other guests, tasting notes and the counter. It’s obviously a subject that needs more discussion. When judging competitions or attending large wine events, I always spit. When tasting wine I need a full mouthful to swish around for an accuate evaluation, little sips just do not work. I am a petite female and wouldn’t be able to walk straight at the end of the day if I swallowed every sip. I’m not shy about using the provided “public spitoon”, but prefer not to. Ideally I use my own plastic cup, one that is preferably not clear.